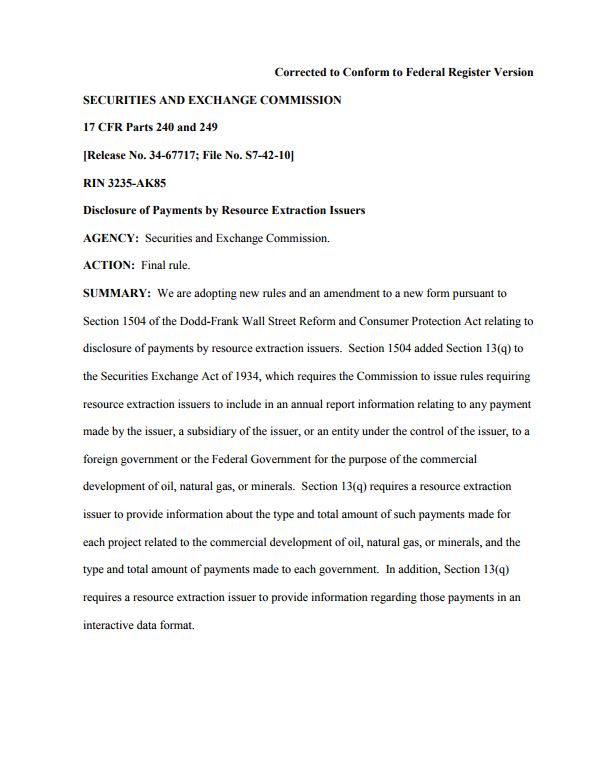 string(1112) "Resource Centre > Uncategorized > Disclosure of Payments by Resource Extraction Issuers"
Section 1504 of the Dodd-Frank Wall Street Reform and Consumer Protection Act relating to disclosure of payments by resource extraction issuers. Section 1504 added Section 13(q) to the Securities Exchange Act of 1934, which requires the Commission to issue rules requiring resource extraction issuers to include in an annual report information relating to any payment made by the issuer, a subsidiary of the issuer, or an entity under the control of the issuer, to a foreign government or the Federal Government for the purpose of the commercial development of oil, natural gas, or minerals. Section 13(q) requires a resource extraction issuer to provide information about the type and total amount of such payments made for each project related to the commercial development of oil, natural gas, or minerals, and the type and total amount of payments made to each government. In addition, Section 13(q) requires a resource extraction issuer to provide information regarding those payments in an interactive data format.